If you really want to split hairs, this salad—one of my all-time favorites—is not really a salad, so to speak. More than anything, it’s a collection of crisp, crunchy vegetables—some pickled, some not—a handful of fresh herbs, and a brisk, punchy sauce, all piled on a bed of cool noodles. It is, in essence, the embodiment of all the elements I love in a dish. It is versatile, it is complex in its bite and flavors, but it is the perfect meal to make on a slow afternoon or evening, when your only pressing plans involve eventually sitting down with friends or family and enjoying a nice, casual meal with one another. This dish may appear to contain far too many steps and ingredients for the casual home cook, but I promise you that a long list of ingredients—many of which are pantry and refrigerator staples—does not equal a prolonged sentence of kitchen labor. Everything comes together in due time, with one item resting while another one steeps, some items cooking while others are being chopped. 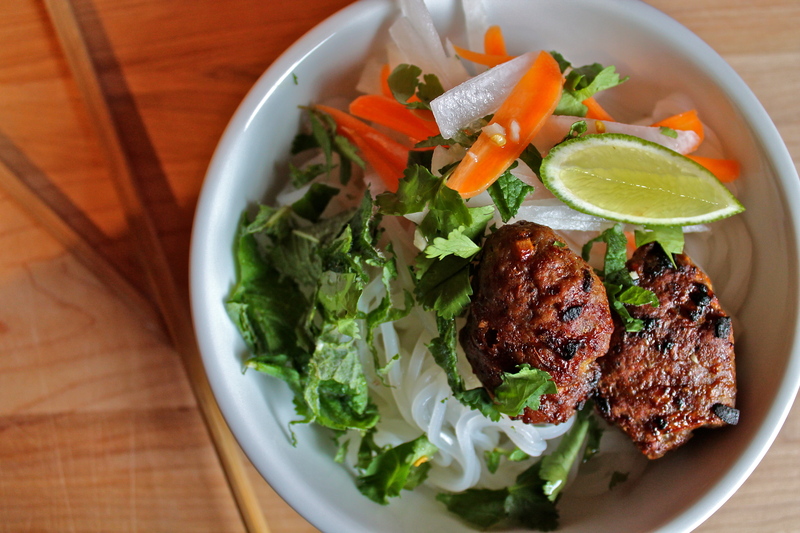 This inspiration for this dish, beyond the dozens of Vietnamese noodle bowls I’ve eaten over the course of my life, comes from Hot, Sour, Salty, Sweet, that veritable bible of Southeast Asian cooking. I’ve extolled the many virtues of Naomi Duguid and Jeffrey Alford before, but it bears repeating that, if you are looking for an all-purpose Asian cookbook, you could do much worse than to get comfortable with a copy of this book. Duguid and Alford, now separated, sadly, have spent years traveling throughout Asia, first as a couple, then eventually as a family of four. Their traveling, while seemingly culinary in its focus, served as much as an education as anything else. To be able to immerse oneself in another culture, or many cultures, so completely is just astonishing in its accomplishment. Reading their books (and there are many from which to choose) is not only a gateway to an entirely new focus in cooking, but also in examining the role and history of food in the lives of people all over the world. Not into meat? These baked vegetable wontons would be a great substitute for the turkey meatballs. Using a very sharp knife or a mandolin slicer, cut the carrots and radish into matchsticks. You should have about 4 cups of matchsticks total. 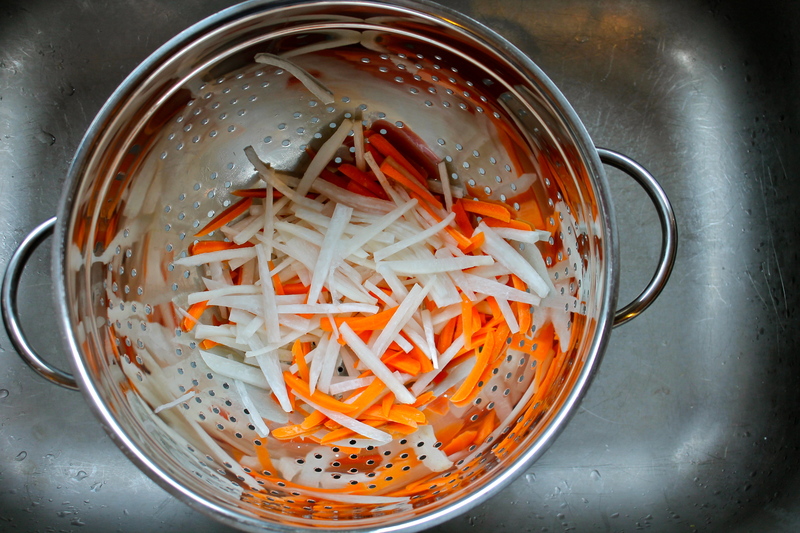 Place the carrots and radish in a large strainer, sprinkle over the salt, and toss well with your hands. Place over a bowl or in the sink, and allow to stand for 20 to 30 minutes. While the vegetables are waiting in the strainer, combine the water, vinegar, and sugar in a nonreactive saucepan and bring to a boil. Remove from the heat and cool to room temperature (the mixture must cool almost completely, as the goal is not to cook the vegetables, but simply quick pickle them). Rinse the vegetables in cold water, then squeeze dry and transfer to a medium bowl. Pour over the vinegar mixture and stir gently to ensure all the vegetables become completely coated. Allow vegetables to sit in vinegar mixture for at least 1 hour before serving. 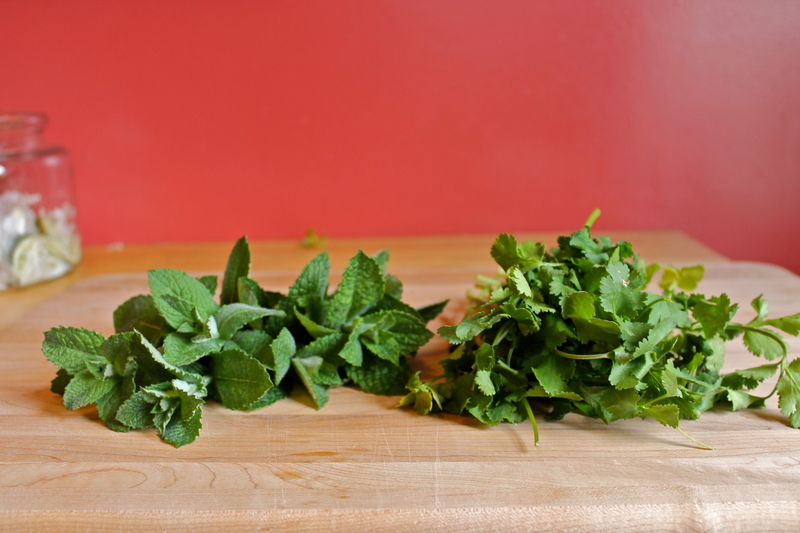 In a small bowl or small jar (I find that a jar works best), combine all the ingredients. Stir or shake (if using a jar) to combine completely, making sure the sugar is completely dissolved. This sauce can be stored in the refrigerator for up to 3 days. 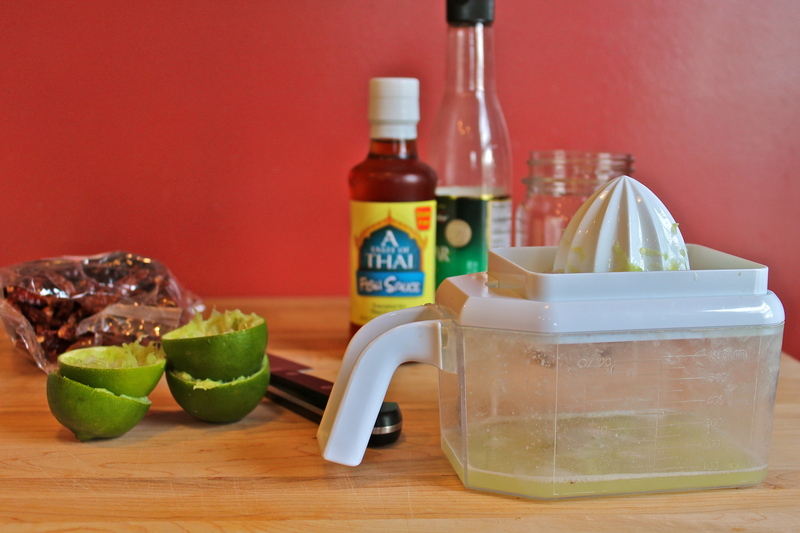 Makes roughly ¾ cup sauce. In a large bowl, combine all the ingredients. Using your hands, mix everything together until they are completely integrated. You can, at this point, cover the bowl with plastic wrap and leave it in the refrigerator for up to 24 hours, or you can proceed immediately to cooking. Place an oven rack 5 to 6 inches from the broiler, and preheat your oven’s broiler on high. Line a large baking sheet with a layer of foil. 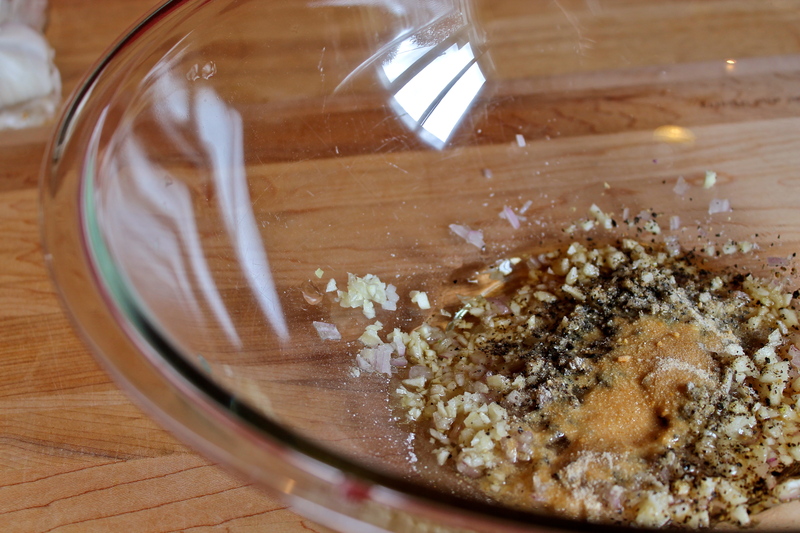 Scoop a generous tablespoon of turkey mixture and, using your hands, form it into a tight ball. Place on the prepared baking sheet. Form all the turkey mixture this way. You should end up with roughly 3 dozen balls. Heat a heavy skillet over medium high heat. Add the rice and dry roast, stirring frequently, until the rice has turned golden brown all over. 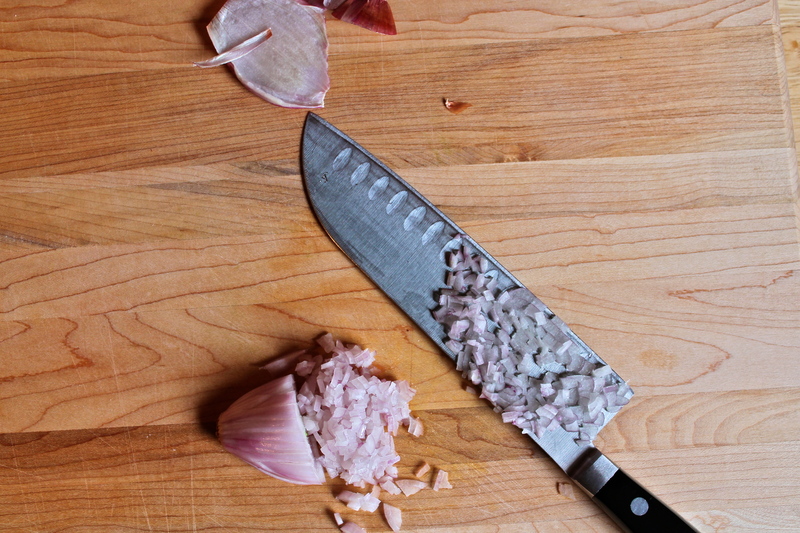 Transfer to a spice grinder, clean coffee grinder, or mortar and pestle, and grind to a powder. 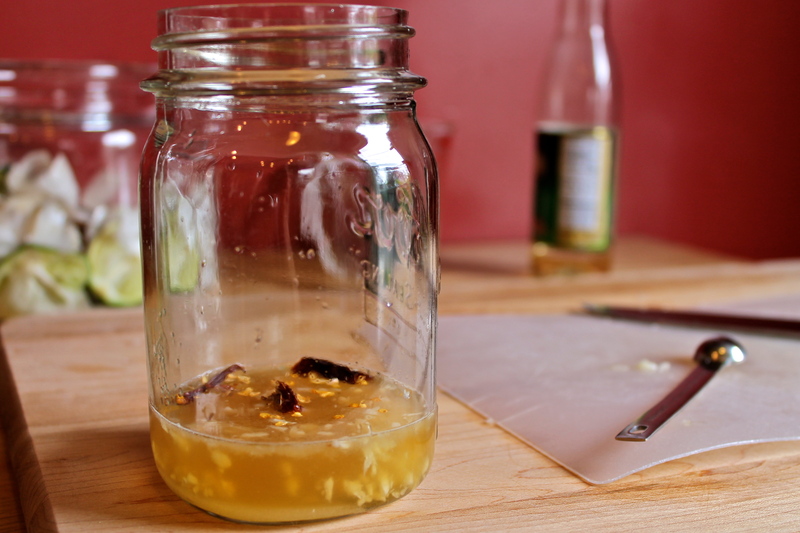 Let cool completely before storing in a well-sealed jar. 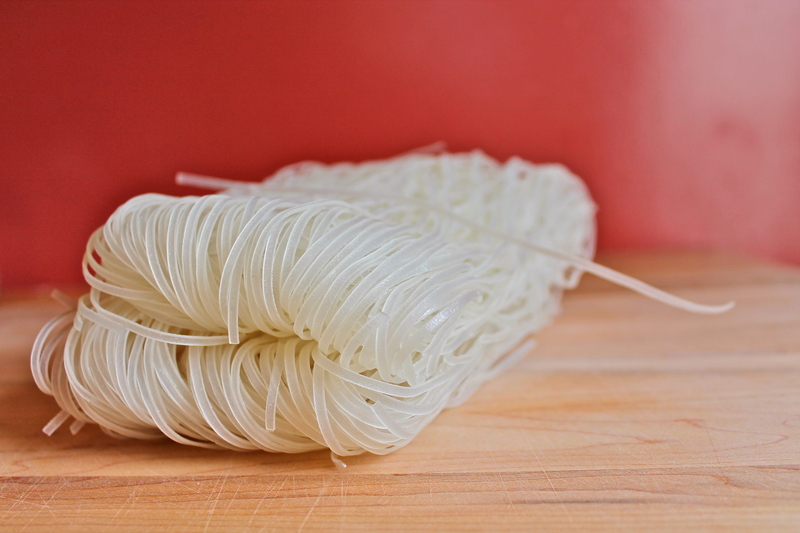 Place a pile of noodles in a bowl of your choice (I like a medium-sized bowl with tall sides). 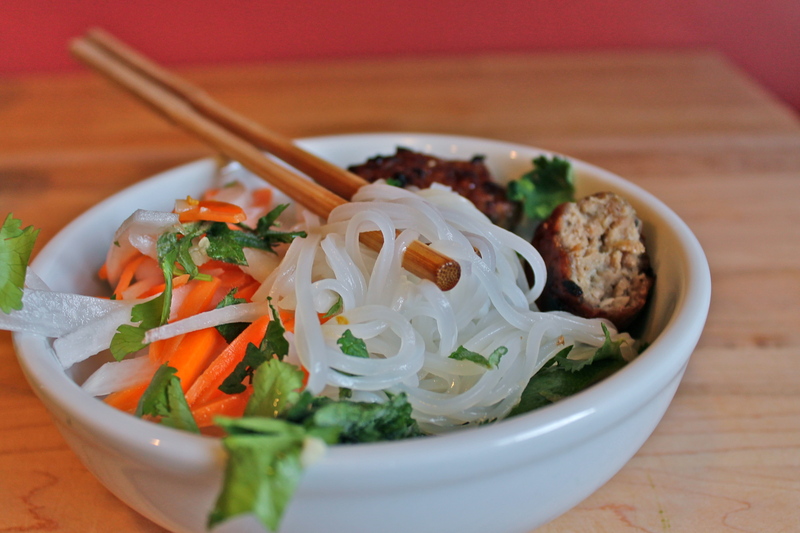 Top with chopped greens, pickled carrots and daikon, cucumber slices, sprouts, and herbs. Add some turkey meatballs. Pour over nouc cham to taste. Add a lime wedge. Wow, this is probably the first time I’ve drooled over turkey meatballs, well maybe the second. These look fantastic, such a light and zesty meal. My mouth is literally watering as I read this recipe. Yum! 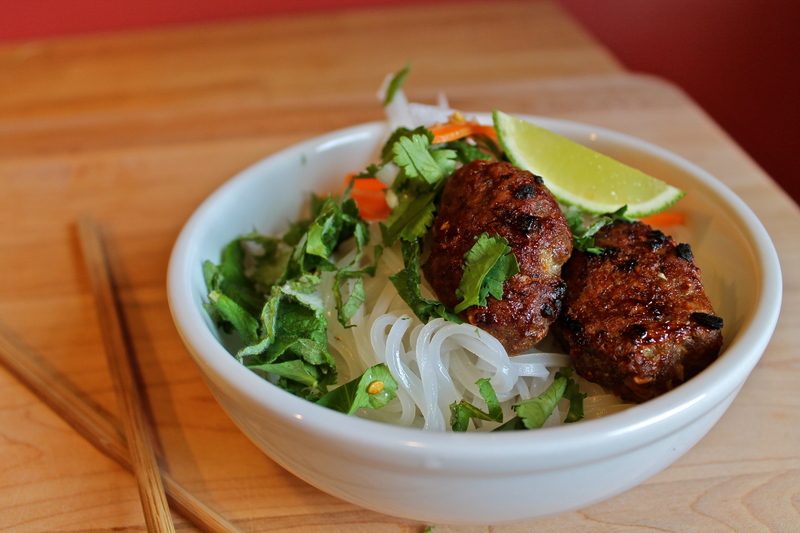 A brilliant spinoff of some of the very best foods from my favorite Vietnamese restaurant. Talk about a mouthful of flavors … .